1. Preheat the oven to 325F. Line 2 large, heavy baking sheets with parchment paper. 2. Finely chop the oats in a food processor. Transfer the oats to a medium bowl. Mix in the flour, baking powder, baking soda, and salt. Set aside. 3. Using an electric mixer, beat the butter and sugars in a large bowl until fluffy. Beat in the eggs and vanilla. Add the flour mixture and stir just until blended. Stir in the toffee pieces, hazelnuts, and chocolate chips. 1. Preheat the oven to 400F. Place shelled nuts, such as walnuts, almonds, pine nuts, and hazelnuts, on a heavy baking sheet or in a pie tin. Toast the nuts in the oven until they are fragrant and golden brown on the outside and pale golden throughout the inside, stirring occasionally and watching closely to ensure they brown evenly and don’t blacken, about 5 to 10 minutes, depending on the size of the nut. Alternatively, preheat a small, heavy skillet over medium- low heat. Place the nuts in the hot skillet and stir them until they become fragrant and golden brown on the outside and pale golden throughout the inside, about 5 minutes. 2. To remove the dark brown skins on the hazelnuts, rub a small handful of cooled toasted hazelnuts at a time briskly between your palms, allowing the skins to fall from your hands and onto a work surface. Don’t worry if a few specks of skin remain on the hazelnuts. I like this fun way of serving lasagna. My kids loved having their own individual rolls of goodness. This recipe was taken from “Giada’s Family Dinners” by Giada De Laurentis. The recipe calls for 3 ounces of thinly sliced prosciutto. I always order from my deli in grams, so I converted from ounces to grams and it works out to 85 grams. The recipe asks to be sure to squeeze the spinach totally dry in order to avoid a watery dish. The ” Quick Marinara Sauce” recipe is also on this blog. 1. Melt the butter in a medium, heavy saucepan over medium-low heat. Add the flour and cook for 3 minutes, whisking continuously. Whisk in the milk. Increase the heat to medium-high. Whisk the sauce until it comes to a simmer and is thick and smooth, about 3 minutes. Whisk the salt, pepper, and nutmeg into the cream sauce. 1. In a medium bowl, stir together the ricotta, spinach, 1 cup of the Parmesan cheese, prosciutto, egg, the 3/4 teaspoon of salt, and the pepper until blended. 2. Bring a very large pot of salted water to a boil over high heat. Add the lasagna noodles and cook until just tender but still firm to the bite, stirring frequently to prevent the noodles from sticking together. Drain. Arrange the noodles in a single layer on a baking sheet to prevent them from sticking. 3. Preheat the oven to 450F. Butter a 13x9x2-inch glass baking dish. Spread the cream sauce over the bottom of the prepared dish. 4. Lay out 4 lasagna noodles on a work surface, then spread about 3 tablespoons of the ricotta mixture evenly over each noodle. Roll the noodles up and arrange the rolls, seam sides down and not touching one another, atop the cream sauce. Repeat with the remaining noodles and ricotta mixture. 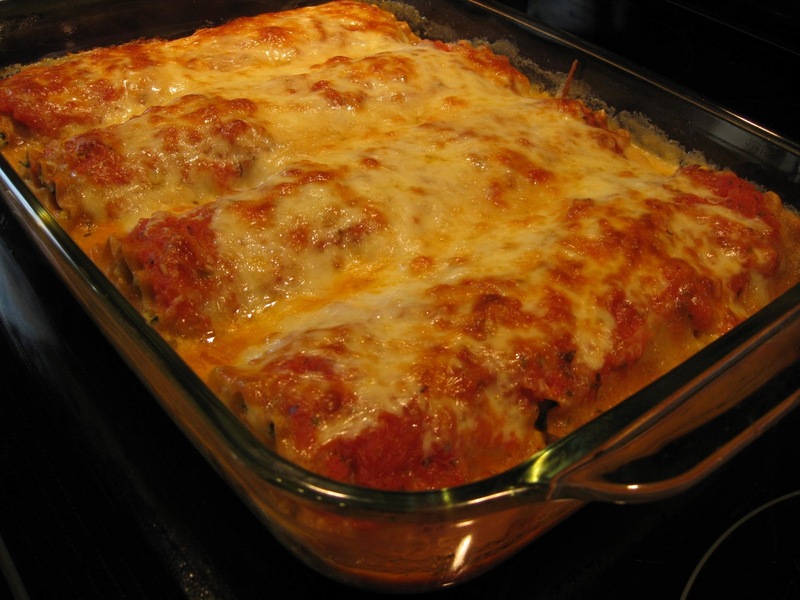 Spoon 1 cup of the marinara sauce over the lasagna rooms, then sprinkle with the mozzarella and remaining 2 tablespoons of Parmesan cheese. Cover the dish tightly with foil. Bake until the rolls are heated through and sauce bubbles, about 20 minutes. Uncover and bake until the cheese on top is golden, about 15 minutes longer. Let stand for 10 minutes. 5. Meanwhile, heat the remaining marinara sauce in a small, heavy saucepan over medium heat until hot. Transfer the sauce to a sauce boat and serve alongside. This coleslaw is so crunchy and good! Perfect for a summer picnic! This recipe is taken from The Best of Bridge “The Best of the Best and More”. I use Ichiban original noodles. 1. Combine all salad ingredients except noodles. Before serving, crush noodles, combine with salad ingredients and toss with dressing. Serves 6. If there’s any left over -save it! Kids love it the next day!